Characteristics: Large-sized, medium dark-green obovate leaves in a dense shrub. Flourishing Season: Larger reddish-pink decorative sterile flowers and smaller white to pink fertile, lacecap flowerheads bloom in mid to late summer. 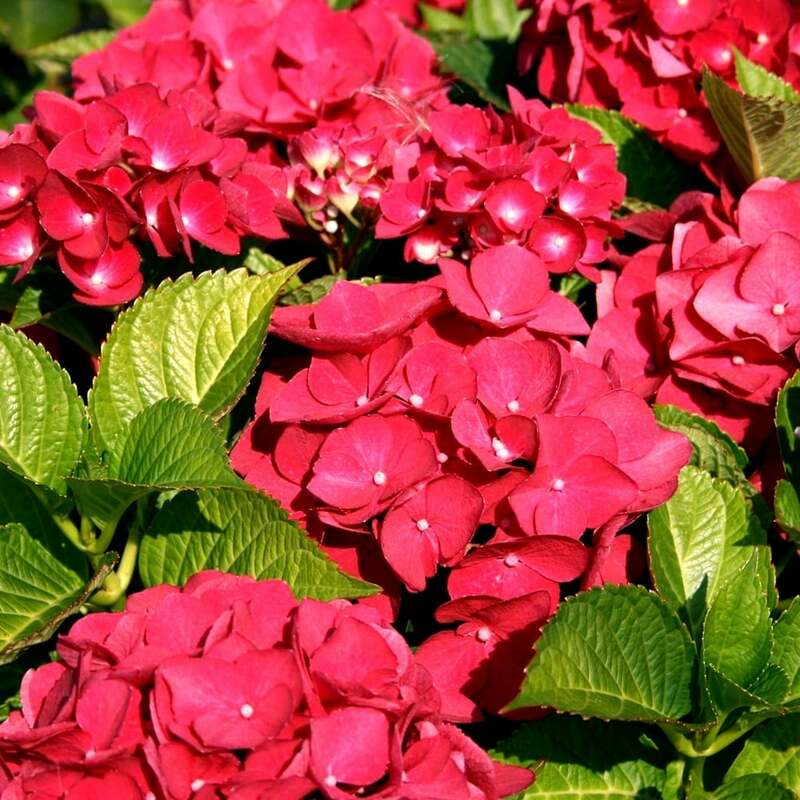 “Teller Red” is one of the best red-coloured Hydrangeas. In order to best achieve these red colours, plant in more alkaline soils. As such, this plant will produce vibrant shades of red-pink flowers, which as a bunch ranges from 15 to 25 cm in diameter. In a more acidic soil, the petals will tend towards a lighter blue to pink shade. The broad flower clusters form in a lacecap and are composed of groupings of florets which vary from being only large and decorative on the exterior of the bunch to fertile and small in the more central area. This shrub has a habit to grow in an oval or rounded shape. It is a medium-sized deciduous shrub with leaves that tend to be a darker green in colour. It is hardy in the UK and can tolerate most extreme winter temperatures down to -10⁰ C.
Hydrangeas prefer moist soils, so if they are kept in the sun, a planter’s box or tub, they should be regularly watered. As such, they do well in partially shaded areas. Like many Hydrangeas, they are good to prune after the flowering season or at the beginning of spring before significant growth. However, they can also be aggressively pruned before the start of the season if the plant has become out of shape or if a particularly cold winter has frozen the plant.